Sophie Merchant had trained as a dental hygienist but she launched Merchant Archive, a vintage marketplace, on the brink of the economic downturn, in 2007. She specialised in selling celebrities, stylists and designers a selection of vintage clothing and jewellery. Due to high demand and the encouragement of her peers, she launched her first shop in Queen’s Park before opening her current outpost on Bloomsbury Street (by way of Kilburn Lane). Also in high demand was Merchant’s curatorial vision. She launched a collection of her own designs for Spring 2015 and was immediately stocked by Net-a-Porter. Fast forward three-and-a-half years and she’s presenting at London Fashion Week at the disused Averard Hotel at Lancaster Gate. Historicism-infused modernity is the modus operandi. In a way, a Merchant Archive show is like a jaunt to a vintage trader’s shop. You venture in, searching for something or nothing but ultimately finding something you want, whether it’s what you set out to find or not. As with most vintage stores there are some things you wish weren’t revived, best left in the epoch they derive from—the peplum waist and A-line trousers. As with most vintage stores there are items you wish were on-trend again—jewel tones and 50s-inspired silhouettes. Most importantly, as a fashion show is a proposition to the consumer, they are left to choose how to style the pieces which is what defines a modern look. Given the emphasis on reference, Merchant’s clothes aren’t particularly groundbreaking but they are forward-thinking. She is compelled to create clothes that are worthy of future archival. It contrasts with many nowadays who are more concerned with the Instagram moment than longevity, which is obviously where her business acumen is at play. 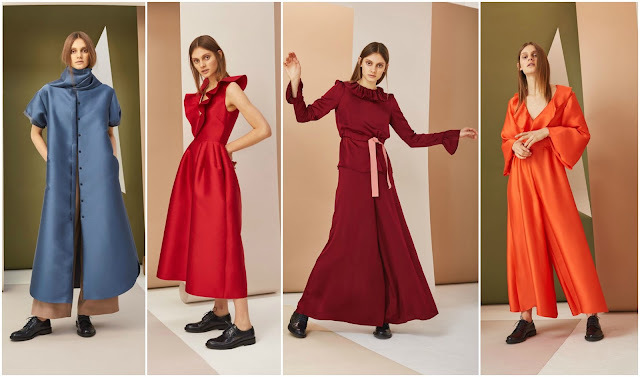 What’s pleasant about Merchant Archive’s presence on the London Fashion Week schedule is its restraint: it doesn’t force itself into the fashion conversation, its clothes are centred on quality and craftsmanship with historic references without being overwrought, kitschy or attention-seeking. And to their advantage, in years to come these are the kinds of clothes you’ll expect to see in secondhand shops, the cycle beginning anew.